Visit the village sign and answer some questions to find the coordinates of the cache. Waterbeach is a large fen-edge village located 6 miles (9.7 km) north of Cambridge in Cambridgeshire in England, and forms part of the administrative district of South Cambridgeshire. The parish covers an area of 8.98 square miles (23.3 km2). Waterbeach is on the Car Dyke, a Roman waterway whose course can be traced as far as Lincoln. Recent archaeological investigations have found extensive evidence of Roman settlement at the southern end of the village. 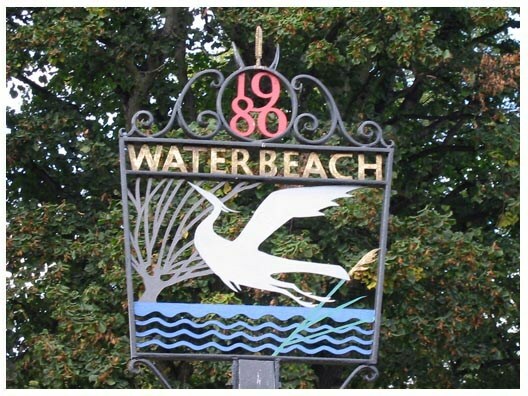 Waterbeach appears in the Domesday Book as Utbech. In the 12th Century, the Knights Templar were located at Denny Abbey located to the north of the village. The parish contains two Scheduled Ancient Monuments: Denny Abbey (which houses the Farmland Museum) and the site of Waterbeach Abbey (near the present church). A Royal Air Force station, RAF Waterbeach, was built on the northern edge of the village in 1940, operating under RAF Bomber Command. After the Second World War, the station was operated by RAF Transport Command and then RAF Fighter Command until 1966, when the site transferred to the Royal Engineers and became Waterbeach Barracks. The small Museum has now closed, though it has been saved and the collection put into storage, for a few years. The barracks closed on 28 March 2013 following the move of all remaining Army units to RAF Kinloss in Scotland and to RAF Wittering during 2012-13. This will be developed into housing for between 6000 and 10000 new homes. The other plaque starts with sign designed and has G lines of text and line 1 has H words in it.